She was summoned to the office. Anxiety, panic and stress surfaced. Am I being fired? What did I do wrong? But she had an idea of what the possible topic of conversation was about. It was 6 months into a 12-month digital marketing plan that had started well. They had created a content marketing strategy that had driven a lot of traffic to the website, there had been a lot of sharing on social media and the readers and viewers had been highly engaged with the great content. The brand awareness had gone up and the corporate credibility had been improved. But it was a short conversation. The boss gave an ultimatum. “This content marketing looks like it is a waste of time and money. Where are the sales? If you want to keep your job I need more than just web traffic, social sharing and engagement. I need more leads“. Content that drives traffic, gets engagement and creates trust and credibility is essential. But if that is all it does, you are leaving a lot of money in the bank. So what sort of content is great for traffic and building brand awareness. The best type is, of course, is content that has a great chance to go viral. But what is the sort of content that people love to share? Here are 4 ideas to get your neurons firing. One that worked for me was “Why You Should Forget Facebook“. It also ended up going viral on LinkedIn with 300,000 views and 1,000 comments! This one from Social Media Examiner “28 Social Media Marketing Predictions for 2015 From the Pros“. 1. If you want to accelerate your sharing then a great way to do that is get tips from the top people in your industry. They often have a lot of social media followers and they will supercharge the sharing on the post because they are mentioned in it. But you will need to get the tip and then let them know when it is published. 2. Some other ideas to consider include using large list headlines while seeming to be redundant and overdone do work! 3. Use headlines that can be defined as having a “curiosity gap”. Don’t reveal the content of the post in the headline! Need more ideas for creating great content that gets shared? Then check out these 2 posts. So what else makes content move fast across the web? This includes not only social networks but email. Buzzfeed and Upworthy have built in multiple ways to do this with your face hover buttons and pop-ups. If you want people to click and share you need to not only reach their mind but touch their heart. 10 images are more shareable than just one! Twenty-one is even better. You don’t have to always be creating unique content. Upworthy, Viral Nova and Buzzfeed are the masters of taking already popular content on the web and taking it viral. They often increase the traffic levels by 1,000% and more. Try collecting and curating some of the top posts on blogs in your industry. Write an intro for each and create a collection. Now viral traffic is intoxicating. When your website traffic takes off you are almost transfixed. We all get excited when viral traffic starts showing up on our blog and website. If you started with zero then one hundred visitors a day is exciting. We all have to start somewhere. You need to build brand trust and credibility….. But at the end of the day content marketers need to achieve a return on investment. A big brand is usually happy with using content to build bigger and better brand awareness. But for small businesses it less about the fluffy stuff and more about the reality of leads and sales. You need to convert website traffic into sales. Otherwise, your content marketing can be big a waste of money and time. What do we mean by “content that converts”? You will need to create content that converts. But what do we mean by conversion? In essence, it is two key tasks. Content Marketing Institute in its latest study revealed the top goals for content marketers. Leads and sales are key! Leads for any business in a digital world now often starts with getting that all important email. A Twitter follower doesn’t count nor does a Facebook like…or even a connection on LinkedIn. That is top of the sales funnel attention. “Social media is still essential for getting your content distributed and creating that all important brand awareness on the social web and beyond. And it’s great for the top of the sales funnel brand building. But don’t expect it to produce direct sales”. It’s just part of the equation. An email is where it starts to get serious. Once you have that email subscriber then you have a lead. Your next challenge is to convert that into a sale. This exact process will vary for each type of company. If you are selling online then the engagement process is done there. If you need to get in front of a person the lead can still happen online but then you need to get that all important face to face appointment. But before we get to looking at the content that converts we need to have a conversation about the tools, resources and technology that make lead acquisition possible at scale. Getting started is sometimes the hardest thing to do but here are the essentials you need to start capturing those leads. Email marketing software: This could be Aweber, MailChimp or any of the dozens of other entry and low-cost email software packages that help you build and control your email list. Do not try and do this with just Gmail or Hotmail. Premium content: This needs to be seen as valuable enough for someone to hand over their email address. A simple ebook or even a PDF for download will do. Design and technology partner: You will need someone to help you ensure you get that premium free content producing those email opt-ins. Most people can’t design even simple landing pages or connect a free ebook download to your email platform. Hire someone to do that for you. After a while, you will want to get serious. You need to surround yourself with the right resources and implement various technologies and tools to help you convert traffic and engagement into leads and sales. Email capture technologies: This includes the tools that I recommend and use such as the Welcome mat from Sumome and the opt-in tool from Optin Monster that captures emails using “Exit on intent” app. Landing pages: The simplest place to start is with Leadpages. But if you want to build longer landing pages then you have some other options. These include plugins for WordPress such as OptimizePress and finally custom designed and developed landing pages which are your most expensive option. Digital marketing automation software: Using starter email systems like MailChimp while a good place to start as you grow you are going to need to look at digital marketing automation platforms. These include Infusionsoft, Marketo, Ontraport and Hubspot to name a few. For a better review, you can check out this article on the 10 Top Digital Marketing Automation Tools according to review ratings on G2 Crowd. Webinar software: There is a range of webinar platforms for hosting online seminars (Webinars). These include GoToWebinar, WebinarJam, Cisco Webex and Adobe Connect. Even the free service Google+ Hangouts could be included in this category (but needs additional add-ons) and a platform built on top of that is Webinars OnAir. Payment gateways: If you want to convert leads into revenue online then you will need a payment gateway that allows you do that easily. Paypal is maybe your best option to start with. But some new players have emerged that are worth keeping an eye on. These include Stripe and Selz. Copywriter: For writing that all important landing page and email copy you can do it yourself. But I would recommend that you hire a professional. Designer: Making a landing page look great is where the designer comes in. Video platform: – You will need a video platform so you can publish and own your videos. There are a bunch out there such as Wistia, Vimeo and many more. Technology partner: Making sure that your website, blog or WordPress site can be updated easily and loads fast is not a job for amateurs. As you grow this is essential. 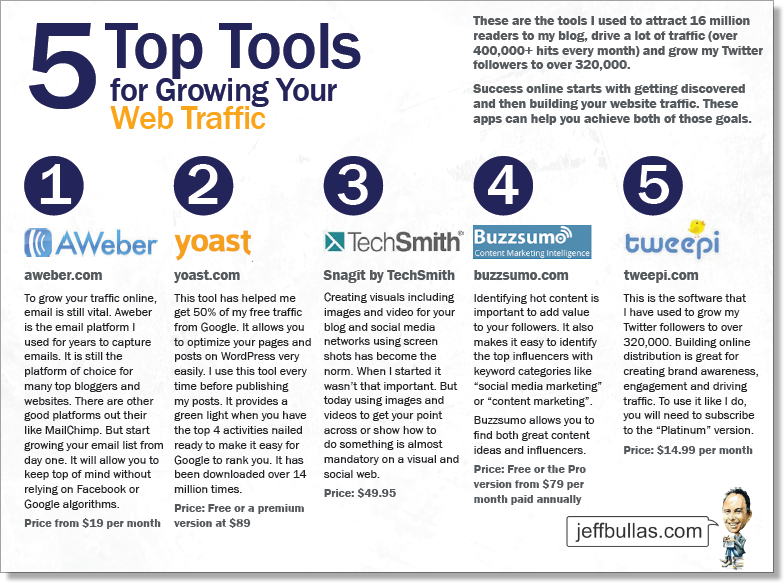 So you have the traffic and you have great content that drives traffic and engages your audience. Now comes the important last stage to ensure that your content marketing is not a waste of time. What are 4 top types of content for capturing leads and turning them into sales? Webinars have proved to be one of the top types of content to collect those email subscribers. These can be hosted on a range of platforms. This includes GoToWebinar, WebinarJam, Cisco Webex and Adobe Connect. Even the free service Google+ Hangouts could be included in this category (but needs additional add-ons) and a platform built on top of that is Webinars OnAir. I use GoToWebinar because I can integrate it with my Infusionsoft to collect those important emails. LeadPages has discovered that it is their top producing lead generator when they partner with other bloggers to promote. 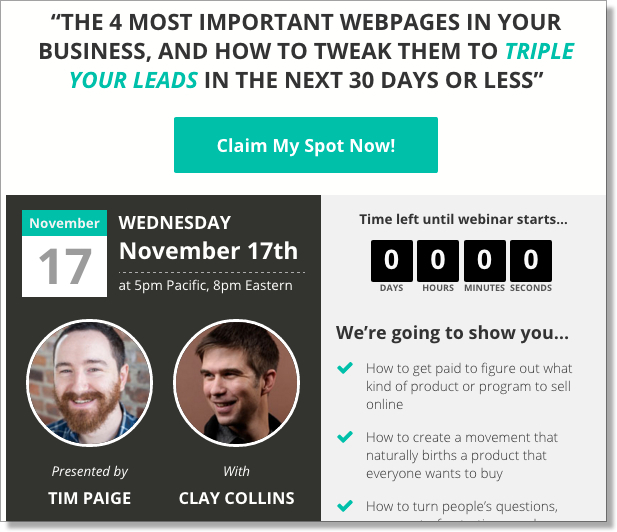 Here is an example of a Leadpages webinar landing page with a collaboration with Clay Collins. To do this you will need to subscribe to GoToWebinar, set up a webinar landing page with lead pages and get these both integrated into your email system. Then it’s time to find someone with a target audience and good sized email list that you can collaborate with to add value to your audience with a great webinar that you jointly promote. 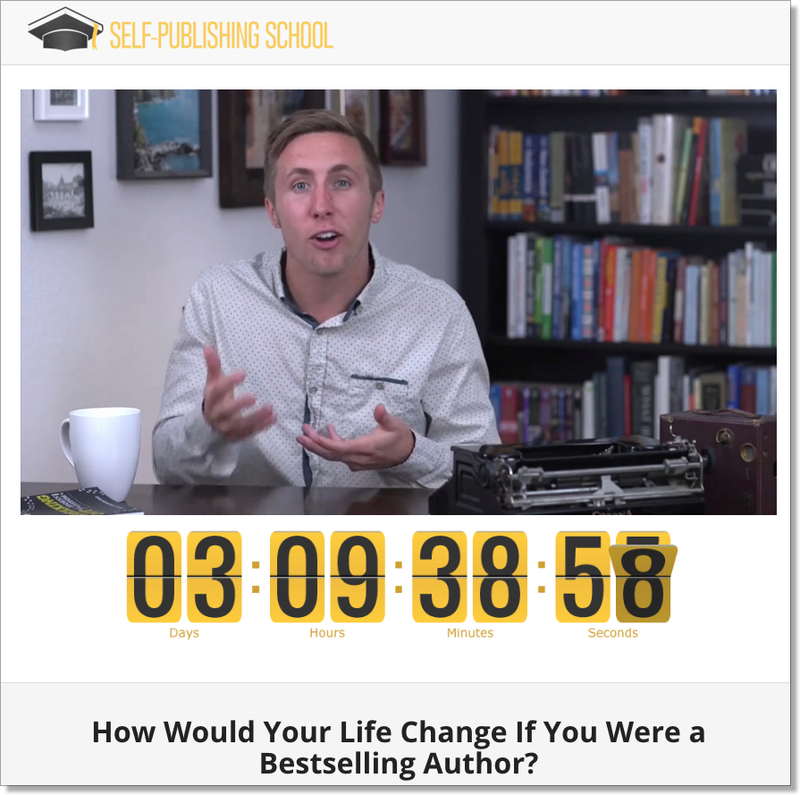 Short free ebooks are one of the best types of content for capturing leads. Another term that is used for this is “Opt-ins”. But printed books can be a great way of capturing leads. These are now often used at the start of a product launch to drive a ton of email opt-ins! Ryan Deiss’s book “Invisible Selling Machine – 5 Steps to Crafting an Automated, Evergreen Email Campaign” is used as a free offer plus shipping to create a small commitment and also gain an email. If you are not up to writing an ebook then creating a 1-2 page PDF that provides a guide or lists some tools can be very effective. To put some perspective on this let’s consider the game of golf. All the amateur golfers want to use the tools (clubs, balls and other equipment) that the pros use. Offering a PDF that lists the tools (software, apps and systems) that you as a “Pro” have used to achieve success in your industry is a logical step to use as an incentive to build your email list. Here is the one I use as part of my “Exit on intent” app from Optin Monster to build my email list. In any successful sales and conversion funnel, you will be using videos that educate and build trust and credibility. In running a promotion it is worth keeping in mind that 75% of the time and the content should be educating and not selling. A marketing funnel is, in essence, more about an educational process with sales and a call to action only being a small part of the tactics. Is your content marketing just about traffic and engagement? Is it a waste of time and money? Could you do better? Building leads and converting them into leads is on is not as much fun as content creation and viral traffic. It’s hard work. It means doing things like A/B split testing, wrestling with apps and grappling with technology. Maybe it’s time to get the right tools and technology and modify your strategy and tactics.